Heat oven to 425°F. In large bowl, mix berries, 3 tablespoons sugar and the cornstarch. 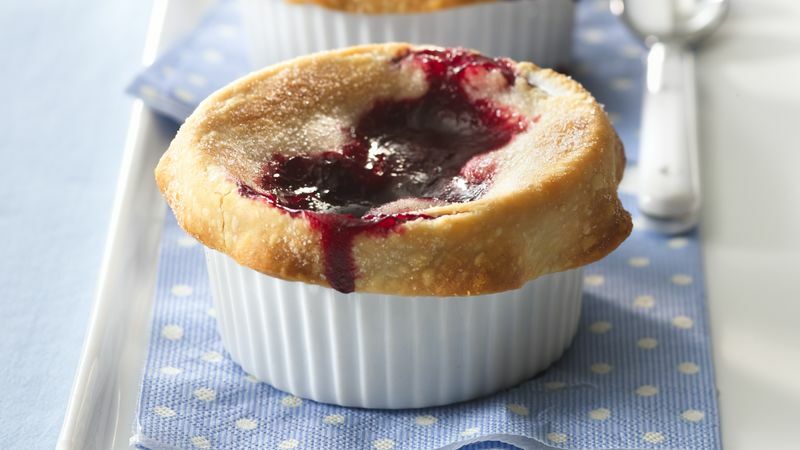 Divide berry mixture among 2 (6-oz) custard cups or ramekins. Unroll pie crust on work surface. Cut 2 (5-inch) rounds from pie crust. Wrap remaining pie crust tightly in food safe plastic wrap and refrigerate for future use. Place each round over pie filling, draping over edges of custard cups. Lightly brush pie crust with egg white. Cut slits on top of each. Sprinkle with 1/2 teaspoon sugar. Place custard cups on cookie sheet. Bake 17 to 23 minutes or until edges are deep golden brown and centers are thoroughly baked. Cool about 30 minutes. Serve warm. Berries in season? Use fresh berries instead of frozen.